THANK YOU TO OUR DIRECTORS, CAST, CREW AND YOU – OUR AUDIENCES! Based on Louisa May Alcott’s enduring classic, Little Women follows the beloved stories of the March sisters as they come of age in Civil War America. This timeless captivating story is brought to life in this glorious musical filled with personal discovery, heartache, hope, and everlasting love. This holiday season, let ArtsWest bring you and your family on this journey of courage, friendship and loss – reminding us to care for what we believe in and to care deeply for those we choose to love. ** An optional event tea can be added to the Saturday matinees. by phone 206.938.0339 – please leave a message when the box office is closed and we will return within 24 hrs. or in person Thursdays & Fridays 1-7:30pm, Saturdays 1:30-7:30pm. This story – based on Louisa May Alcott’s own childhood – is so deeply etched in the cultural and emotional landscape of our country, that it resurfaces generation after generation to capture our hearts. This holiday season, let ArtsWest bring you and your family on this journey of courage, friendship and loss – reminding us to care for what we believe in and to care deeply for those we choose to love. Special Event Teas – Saturday Dec. 14 & 21 = SOLD OUT. 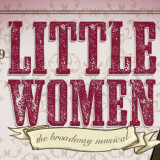 Little Women Plays to Rave Reviews!